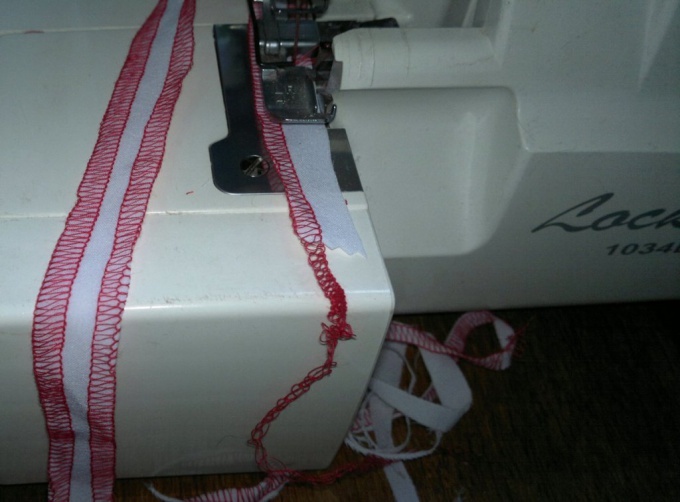 When we first met with the serger should be paid great attention to his instructions, where can I find a diagram of the filling. As well there is a detail to paint the purposes of all adjustments and their location. Many manufacturers indicate the recommended values, to obtain high-quality lines. If instruction could not be found for any reason, you have to have patience and start experimenting. First you need to prepare a serger, thread and material. Moreover, the threads must be odinakovogo quality, but a different color (so it will be easier to understand). Material first you need to take a simple (not knit, not too thin nor too thick). Best calico or something like that. Further, after proper refilling you need to set all controls to the tension of the thread on the average, usually 3 or 4 and stitch a small distance, the line may be far from perfect. Compare it with the line to have the finished product, for example: shirt, t-shirt etc. Now let us begin to understand the adjustments. Try to twist one of the regulators tension of the thread (clockwise - increase; counterclockwise - decrease). Look at the resulting line. If you increased the tension of the yarn, the thread needs more to pull the material. If reduced, respectively, then the thread will be more free to lie in the line (zigzag). Check for yourself what the string in the line corresponds to this adjustment. Back tension at the same (average) value and repeat the experiment on other regulators. Thus, dealing in turn with all the tensioners, it is possible to determine the optimal settings. In addition to the adjustment of the yarn tension in the lines of it is you can adjust the density of stitches, trimming edge and differential feed. Density adjustment changes the amount of promotion material for one shot. Adjustment of the trim edge it is possible to achieve a better fit of the threads to the cut-off edge. But the adjustment of the differential feed adjusts feeding of the material, regulates the Assembly and stretching of the material. The average value of this adjustment - 1 (it is better to leave the unit until then while it will not deal with the rest of settings). If you want to make the Assembly of the material, the value is greater than one. A value less than one (most often used on knits), it is in those cases when the material to be stretched (to give a margin for tension). After you understand the purposes of all adjustments and each of them will be tested in different variants, is not difficult to adjust the line as well as in the factory product.